MailChimp is an extremely popular email service. It makes sending one off emails to large groups of people very simple. Common use cases include sending newsletters, special offers, feature releases etc. Why Should I Integrate MailChimp with GoSquared? How do you decide when to send emails? How do you decide who to send emails to? How do you keep track of who’s unsubscribed from your newsletter? People CRM makes answering these questions obvious, it's a fully filterable database of all your users' online behaviour. Saving those filters as Smart Groups makes intelligently targeting your emails easy. Track MailChimp subscribe/unsubscribe events in line with all your other user behaviour. Automatically update MailChimp lists directly from Smart Groups. To get started you’ll need to have MailChimp account — you can sign up for free here. You’ll also need to have created at least one mailing list in MailChimp so that we have something to track. Log into your GoSquared account and head to Settings > Current Project > Services > Mailchimp. Click ‘Connect’ — This will connect your GoSquared account with MailChimp (you may be asked to log in to your MailChimp account). Note: You can only connect one MailChimp account to each of your GoSquared sites. 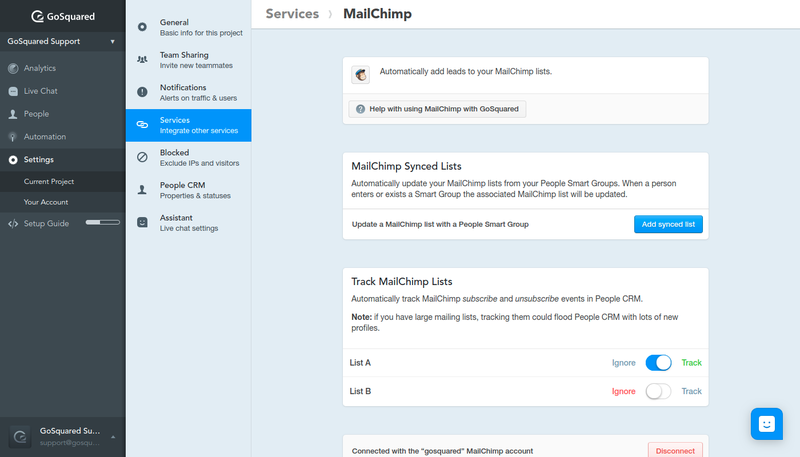 After connecting your MailChimp account, your MailChimp lists will be available to configure in Settings > Current Project > Services > Mailchimp. You can use the toggles to track changes to each Mailchimp list. For example, if a list gets a new subscriber, they will get added to People CRM. Or if a user unsubscribes, this will track an un-subscribed event in People CRM. Use the toggle switches to choose which lists you would like. Note:This will not import your whole mailing list into People CRM, it will only create profiles when a new user subscribes to the list, or an existing user un-subscribes. Note: GoSquared tracks MailChimp events by associating them with the person's email address in the People CRM. If GoSquared can’t find a profile to match the event to, it will create a new profile for them. Smart Groups enable you to segment your user-base via any combination of events and custom properties you like. We call them 'Smart’ because they update in real-time. New people will automatically fall into the group as their behaviour matches the filters you’ve defined. Likewise people will automatically fall out when they no longer match the filters. Just click ‘Add a filter’ in the People app — add as many filter as you like. Change what columns are visible by clicking the cog at the top of your People list. Once you’re happy hit the ‘Save Smart Group' button in the top right of the People app and give it a memorable name. Each saved group will appear as a list in the sidebar — you can create as many as you like. Use the drop down list to select a MailChimp list you want to keep updated. Then select a Smart Group that you want to use to keep the MailChimp list up to date with. When you click 'Save Integration' everybody currently in the Smart Group will be added to your MailChimp list. We won't create duplicates if they're already on your mailing list! When a new person enters the Smart Group they will be automatically subscribed to the linked MailChimp list. When a person exits the Smart Group they will automatically be deleted from the MailChimp list. If a person manually unsubscribes from your mailing list, GoSquared will not re-subscribe them. Deleting a list in MailChimp will not delete the linked Smart Group in GoSquared.